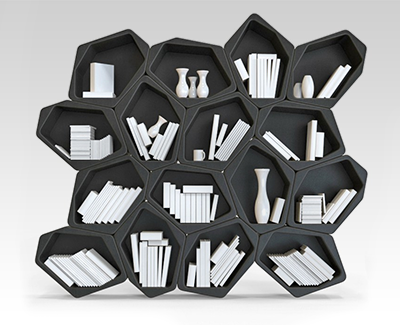 As shelving or partition, freestanding or mounted on the wall, BUILD adapts to your needs. An individual element can double as transport box or seating. BUILD is quick and easy to install and can be reconfigured in minutes, with any number of units. No instructions, no tools. BMW has finally made a real EV. It’s not another retrofit hack-job that stuffs an electric motor and battery pack into car that was never intended for electrification. It’s been designed from the ground up to serve two purposes: electrify the automaker and stay true to the Ultimate Driving Machine tagline. This is the BMW i3 and it’s the most innovative thing to come out of Munich in a decade. First, the stats. The i3 is packing a 22 kWh lithium-ion battery pack good for a claimed range of between 80 and 100 miles — on par with the majority of new EVs on sale. Charging takes three hours over a 220-volt line and into a massive 7.4 kW on-board charger, one of the largest on the market. BMW claims that charge time can be reduced to 30 minutes using an optional DC Combo Fast Charging setup. In proper BMW fashion, 170 horsepower and 184 pound-feet of torque is delivered to the rear wheels through a single-speed transmission. And that hybrid-synchronous electric motor mounted out back revs out to a (silently) screaming 11,400 RPM. BMW claims the i3 will go from 0 to 60 mph in an impressive seven seconds, and maxes out at an electronically limited 93 MPH for ultimate efficiency. And just like every BMW on the road, it has a perfect 50:50 front-to-rear weight distribution which provides that phenomenal handling that solidified BMW’s reputation as a driver’s brand. But despite all those stats, one number stands out: 2,700 pounds. 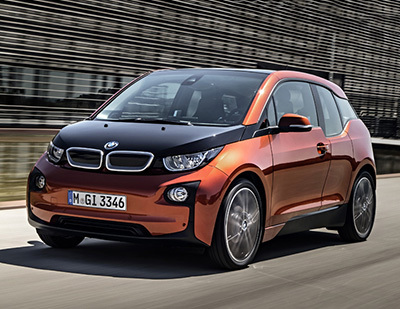 That’s the i3′s curb weight, making it one of the lightest electric vehicles on the market. "What we want is a robot that can go anywhere, even over terrain that might be broken and uneven," Johnson says. "These latest jumps greatly expand the range of what this machine is capable of, as it can now jump onto or across obstacles that are bigger than it is." 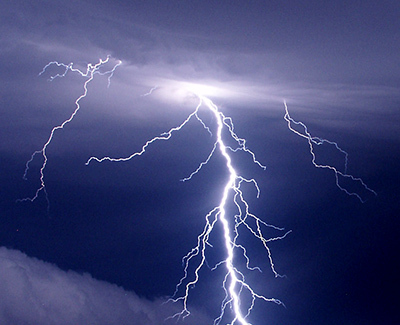 While light normally travels at just under 300 million metres per second in a vacuum, physicists managed to slow it down to just 17 metres per second in 1999 and then halt it completely two years later, though only for a fraction of a second. Earlier this year, researchers kept it still for 16 seconds using cold atoms. To break the minute barrier, George Heinze and colleagues at the University of Darmstadt, Germany, fired a control laser at an opaque crystal, sending its atoms into a quantum superposition of two states. This made it transparent to a narrow range of frequencies. Heinze's team then halted a second beam that entered the crystal by switching off the first laser and hence the transparency. The storage time depends on the crystal's superposition. A magnetic field extends it but complicates the control laser configuration. Heinze's team used an algorithm to "breed" combinations of magnet and laser, leading them to one that trapped light for a minute. At full pelt, light would travel about 18 million kilometres in that time – that's more than 20 round trips to the moon. "One minute is extremely, extremely long," says Thomas Krauss at the University of St Andrews, UK. "This is a major milestone." 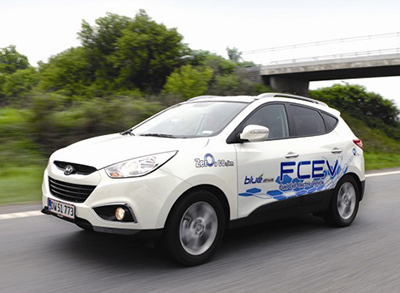 Five Hyundai ix35 fuel cell vehicles will soon hit London’s roads as part of the London Hydrogen Network Expansion (LNHE) project. The LNHE is aiming to establish the first hydrogen transport infrastructure in the southeast of England, and is being run by a consortium of companies that specialise in different aspects of using hydrogen as a fuel. The hydrogen-fuelled ix35 will sprint from 0-62mph in 12.5 seconds, has a top speed of 100mph and has a range of 369 miles from each tank of hydrogen. For comparison, the ix35 1.7-litre diesel completes 0-62mph in 12.4 seconds and will hit 108mph. The fuel cell Hyundai take around three minutes to refuel. At present, there are two hydrogen filling stations in London – one open to the public – and a third is planned as part of the LNHE. Three more stations will be built by 2015, by which time, the LNHE project hopes to have around 50 hydrogen-powered test vehicles on the road, including buses and taxis. Back in 2009 Edwards and French designer Francois Azambourg began developing a new technology to eliminate packaging from foods. Called WikiCells, the edible soft skins are made from natural food particles that are bound together by nutritive ions. The goal was to reduce plastic waste while improving human health through portion control and vitamin-supplemented skins. WikiPearl is the first commercialised product born from the technology, mainly because ice cream is delicious, and it’s the least weird form his WikiCells could possibly take. “Some products are a more radical departure from what people are used to than others,” he says. 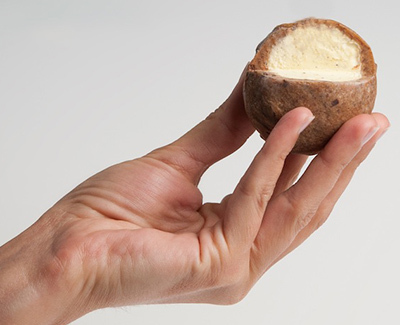 “But ice cream and frozen yogurt in the WikiPearl form is really easily understood. 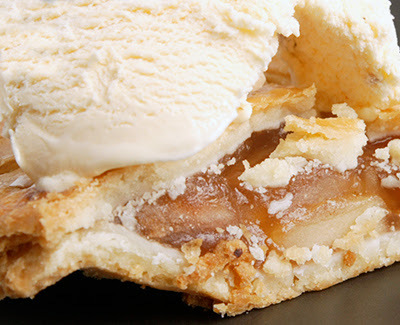 An added bonus: they melt slower than regular ice cream. Put a few balls inside a specially-designed cooler that’s sold at WikiBar and Edwards says they can last up to eight hours. But WikiPearls is really just the beginning for Edwards. He estimates that by 2014 wiki vending machines where customers can make their own combinations of filling and skins, should be available. “You could say I want an orange soda with a french fry skin, or whatever it is,” he explains, “And then it’s made there in the machine.” Long-term, he envisions wiki technology in the home where parents could customise the fillings and skins to make their children a package-free lunch. 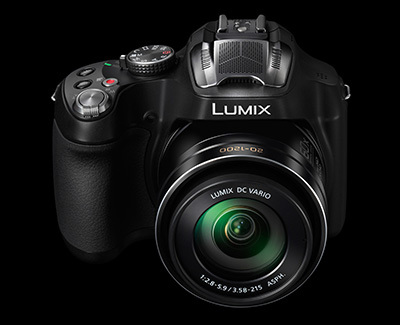 Panasonic has announced the Lumix DMC-FZ70, a 16.1MP compact superzoom with a 60x optical zoom. Spanning the equivalent of 20-1200mm it's the largest zoom lens available in a consumer compact. The FZ70's zoom lens has a maximum aperture range of F2.8-5.9, and the camera introduces a new 1/2.3-inch CMOS sensor capable of 1080/60i video. Side-by-side with the FZ60, the size difference in the lens is immediately obvious. The FZ70's optics are much larger, as expected, making the camera's overall footprint notably increased. The camera hits a competitive price point at $399, and it seems that some concessions were made in build quality to hit that number. The camera is encased in a composite plastic that feels slightly cheap, especially on the bottom panel. There's a nice deep handgrip though, and the command dial on the back panel makes it easy to change exposure settings quickly. There's no use resisting the temptation to immediately zoom in to 1200mm equivalent once the FZ70's in hand, so we turned the camera to the streets far beyond and below the office. Zooming to the full telephoto end of the range is done in less than four seconds and the action of the lens is smooth. Using the FZ70 to its full telephoto potential revealed people on the streets below that we hadn't been able to spot with the naked eye. Once focused on these distant subjects, we were able to track them without much difficulty. Image stabilization is aggressive at the long end of the zoom, and it needs to be. At 1200mm equiv. there's no chance of hand-holding and getting a clear shot, unassisted. The stabilization system fights minor camera shake effectively, shifting to a new subject relatively smoothly when panning across a scene. Tesla got the factory for a song from Toyota in 2010, spent about a year or so setting up tooling and started producing the Model S saloon in mid-2012. The automaker brings in raw materials by the truckload, including the massive rolls of aluminium that are bent, pressed, and formed to create the car. The lightweight components are assembled by swarm of red robots in an intricate mesmerising ballet. Editor Note: If you've got a Frankenstein Complex (aka Robobphobia/Terminator Syndrome), look away! If not, it is worth visiting YouTube and choosing a higher resolution version of the video. Bubble wrap - first invented as three-dimensional wallpaper - started protecting valuables in 1960 and is branded by the Sealed Air company. It's typically made from polyethylene, with a bubble-shaped side bonded to a flat side. The new metallic form can offer protection in spaces only a few millimetres thick. Packaging can be made that is very thin and much stronger than the plastic variety. 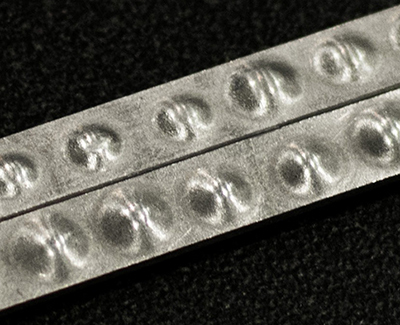 Afsaneh Rabiei, professor of engineering North Carolina State University, and her team started with a thin sheet of aluminum and used a studded roller to form small indents in the sheet. Instead of capturing air in these indentations, she filled them with a foaming agent like calcium carbonate or titanium hydrate. When such agents are heated they form bubbles within the metal. Then they bond this indented sheet to another flat sheet of aluminium, sandwiching the foaming agent in the separate recesses. Last, they heat the bonded sheets and the foaming agent forms bubbles, much in the way baking soda causes a cake to form its porous crumb. It is the bubbles that absorb the energy and shock from any load placed on the material. Mini-PC maker CompuLab has unveiled the next generation of its teeny, Tegra 2-powered Trim-Slice computer. Nvidia's processing heart has been swapped for a Freescale i.MX6 system-on-chip that's available with single, dual or quad cores. The system can run either a desktop-grade Ubuntu or a fully-featured Android operating system, but the best news is a starting price of just US$99. Dotted around its simple 5.3 x 3.9 x 0.8-in (135 x 100 x 21-mm) "no-screws" housing, you'll find two Gigabit Ethernet LAN ports, five USB ports (including one micro USB On-The-Go connector), two RS232 Serial ports, HDMI 1.4 and DVI-D display ports that each support up to 1920 x 1200 pixel resolution, and both S/PDIF 5.1 and analog audio. Under the hood, its ARM-based Cortex-A9 processor runs up to a 1.2 GHz quad-core configuration, and sits alongside a video processing unit capable of supporting multi-stream 1080p H.264 video, with graphics API support in the shape of OpenGL ES 1.1 and 2.0, OpenVG 1.1 and OpenCL EP. Systems are available with up to 4 GB of DDR 3 RAM and up to 512 GB of mSATA solid state storage (with expansion possible via an included micro-SDXC card slot). 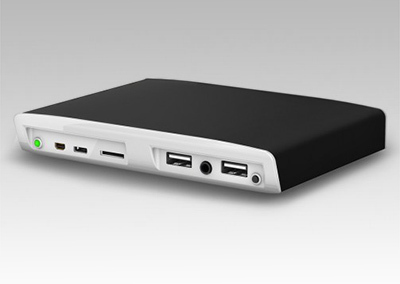 The Utilite also gets 802.11b/g/n Wi-Fi via a single antenna, and Bluetooth 3.0 wireless technology. 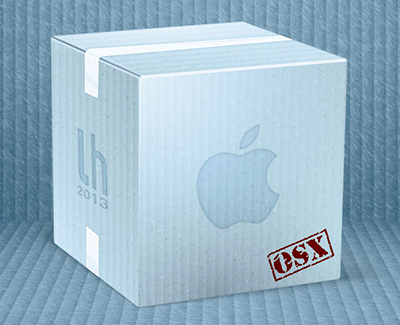 Every day brings new apps to OS X. Few are gems, but some stand out from the crowd. In our fifth annual Lifehacker Pack for Mac, we're highlighting the best downloads for better productivity, communication, media management, and more. As impressed by we all were by Petman, DARPA and Boston Dynamics' remarkably agile and nimble humanoid, it's about to get upstaged by the company's latest and greatest robot creation: ATLAS. Not only does it keep its balance and remain standing after being hit by a 20-pound wrecking ball, ATLAS also tackles a treadmill, staying on two feet while two-by-fours and other obstacles are tossed in its path. Where can you spend a day at work, do some serious shopping, sleep in a five-star hotel, go ice skating, swimming AND tanning without ever stepping outside? 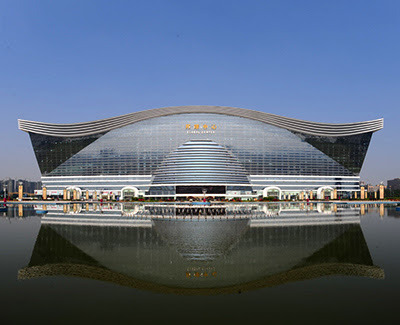 At the New Century Global Center, in Chengdu, China. The recently opened city-sized structure is being called the "world's largest standalone structure" by Chinese officials. According to the Independent, the complex measures roughly 1.7 million square meters. It is approximately the size of Monaco, could hold 20 Sydney Opera Houses and is three times the size of the Pentagon Building in Washington, D.C. Beyond just offering office spaces, shopping, and entertainment in the form of a 14-screen IMAX movie theater, the building also boasts two, 1,000-room five-star hotels, "Paradise Island" water park, an artificial beach that can accommodate 6,000 people and a faux sun that will shine 24 hours a day. A giant LED screen mimics shoreline and ocean. Rust could help boost the efficiency of hydrogen production from sunlight - a potentially green source of energy. Tiny (nano-sized) particles of haematite (crystalline iron oxide, or rust) have been shown to split water into hydrogen and oxygen in the presence of solar energy. The result could bring the goal of generating cheap hydrogen from sunlight and water a step closer to reality. Researchers from Switzerland, the US and Israel identified what they termed "champion nanoparticles" of haematite, which are a few billionths of a metre in size. 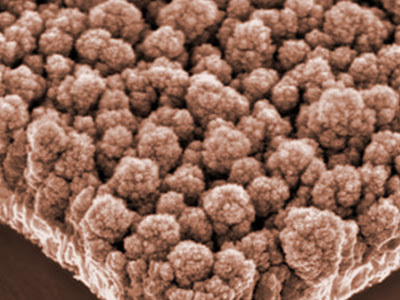 Bubbles of hydrogen gas appear spontaneously when the tiny grains of haematite are put into water under sunlight as part of a photoelectrochemical cell (PEC). Where the particle is correctly oriented and contains no grain boundaries, electrons pass along efficiently. This allows water splitting to take place that leads to the capture of about 15% of the energy in the incident sunlight - that which falls on a set area for a set length of time. This energy can then be stored in the form of hydrogen. Iron oxide is cheap, and the electrodes used to create abundant, environmentally-friendly hydrogen from water in this photochemical method should be inexpensive and relatively efficient. The hydrogen made from water and sunlight in this way could then be stored, transported, and sold on for subsequent energy needs in fuel cells or simply by burning. 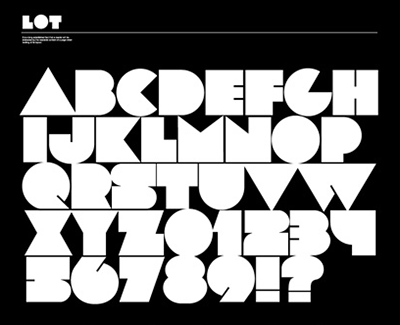 HypeForType has made this ultrabold, uppercase-only display face available for free download. 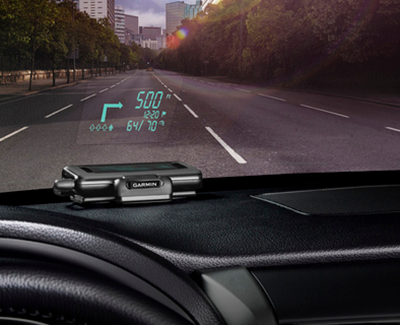 Garmin has announced the HUD, a portable heads-up display unit for vehicles that can receive navigation instructions from a smartphone and display them on any car's windshield. Paired with a transparent film that sticks to the window or a dedicated reflector lens, the HUD is designed to make sure drivers keep their eyes on the road instead of looking at various screens for navigation purposes. The HUD pairs over Bluetooth with Garmin's StreetPilot or Navigon apps for smartphones, and it can display turn arrows, distance to the next turn, current speed and speed limit, as well as estimated time of arrival. It also offers speed limit alerts, traffic delays, and locations of cameras, and guides drivers into the correct lanes they need to be in. Garmin claims that the unit can auto adjust its brightness so that it is visible in direct sunlight or at night. A drone zipping over fields in Denmark can spot the tiny colour variations that give away the presence of weeds in amongst the crops. Logging the coordinates, it can then send a ground vehicle in to spray the densest patches, reducing the need to spray whole fields. This is the ASETA project, led by Anders La Cour-Harbo of Aalborg University in Denmark. It aims to reduce herbicide use by concentrating weedkiller only in places where it is needed most. 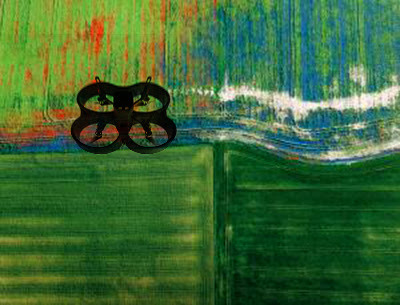 The project uses a camera attached to a UAV to survey the fields. The camera is tuned to pick up parts of the light spectrum that correspond to the reflective signatures of the weeds and crops it is looking for – for example, thistle sticks out because it absorbs yellow light more than surrounding beet plants. Information is sent back to a central computer, where it is used to update previous flight maps of the fields. The system then identifies areas that could be dense with weeds, and sends the ground vehicle in for a closer look and possible spraying. It's all automatic: the only human input is defining the boundaries of the field to be surveyed. The drone system is currently being trialled in Denmark. The cells of the body contain DNA, which contains genes. We inherit our genes and they cannot be changed. The genes, however, have 'methyl groups' attached which affect what is known as 'gene expression' - whether the genes are activated or deactivated. 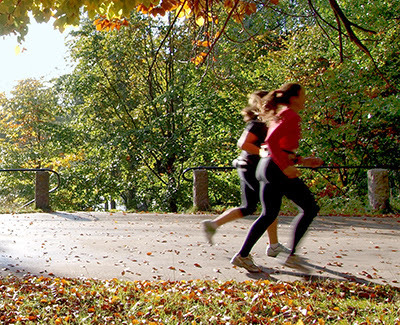 The methyl groups can be influenced in various ways, through exercise, diet and lifestyle, in a process known as 'DNA methylation'. This is epigenetics, a relatively new research field that in recent years has attracted more and more attention. "They were supposed to attend three sessions a week, but they went on average 1.8 times," says Tina Rönn, Associate Researcher at Lund University. Using technology that analyses 480,000 positions throughout the genome, they could see that epigenetic changes had taken place in 7,000 genes (an individual has 20-25,000 genes). They then went on to look specifically at the methylation in genes linked to type 2 diabetes and obesity. "We found changes in those genes too, which suggests that altered DNA methylation as a result of physical activity could be one of the mechanisms of how these genes affect the risk of disease," says Tina Rönn, adding that this has never before been studied in fat cells and that they now have a map of the DNA methylome in fat. If you regularly drop your iPhone 5, this could have your name on it. An international team of researchers have developed the world’s first telescopic contact lens — a 1.17mm thick pair of contact lenses that, when you want them to, will magnify your vision by 2.8x. The lenses use patterned aluminium mirrors to reflect the incoming light rays four times, magnifying the resulting image and correcting for chromatic aberrations in the process. 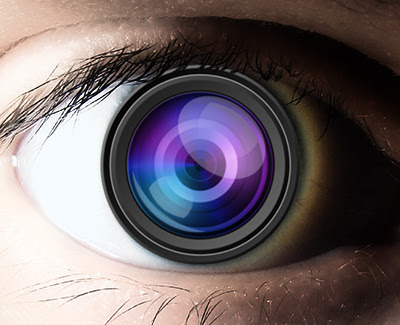 The magnified image is then projected onto the edge of your retina. Each lens comes with a clear portion in the middle that allows light through unaffected, and a telescopic portion on the outside. In order to allow users to choose between magnified and unmagnified sight, they equipped the lenses with a polarizing filter in front of the clear portion, so that switching between the two is as easy as putting on a pair of polarizing 3D glasses. People with age-related macular degeneration (or AMD) suffer from degradation of the high-resolution fovea at the centre of the retina. These contacts project a magnified image on the lower-resolution perifovea, greatly enhancing these peoples’ ability to see details like text. 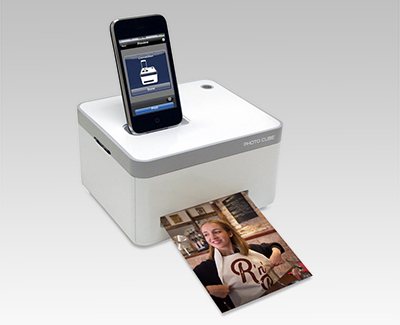 The compact photo printer is small and compact at 7 x 4 x 6”, and produces 300dpi 4”x 6” prints in under a minute. Dock accommodates all iPhones up to 4s. Compatible with the iPhone 5, iPad with Retina Display and iPad Mini and Android smartphones (OS 2.0 & above) by plugging the device into the USB port.